歌手兼作曲家諾雅(Achinoam Nini)具有葉門猶太人血統, 出生於以色列, 在紐約長大, 是一位國際知名的音樂家. 她曾經在世界各地著名的場合表演過, 包括在梵諦岡為教宗表演, 還在白宮, 卡內基音樂廳, 林肯中心和歐洲最重要的劇院表演過. 爵士樂名人派特麥席尼(Pat Metheny)與昆西瓊斯(Quincy Jones)公開支持她並為她製作專輯, 她也曾經和史提夫汪達, 史汀, 安德烈波伽利等許多知名歌手同台演出. 她獲得過義大利第三等功績勳章(Commander of the order of Merit of the Italian Republic), 是聯合國親善大使, Global Leader of Tomorrow, 曾經以她的才藝和致力於以色列人和巴勒斯坦人和平而獲得過無數獎章. 諾雅的新專輯(給巴哈的信)由昆西瓊斯製作, 內含12首原本是巴哈寫給樂器演奏的音樂被她加入英文與希伯來文的歌詞來演唱. 這些歌詞受到許多主題影響: 科技與宗教, 世界暖化現象, 女性主義, 安樂死, 以巴衝突, 社群媒體時代下的人際關係. 音樂改編成吉他演奏版是由她長期音樂合作夥伴吉爾多(Gil Dor)所寫, 他是一位吉他手, 作曲家, 編曲家和教育家. 這兩人組的精彩表演讓人驚訝, 諾雅的歌聲莊嚴美麗並在音符之間如嬉戲般地跳躍著, 中間穿插著吉爾的吉他彈奏, 凸顯出巴哈傑出的複音之聲. 在這張專輯中, 諾雅和吉爾努力破除糾結的語言, 宗教, 世代和社會汙名的高牆, 在巴哈這位超級偉大的溝通者贊助下, 建立一座以音樂精英, 尊重和歡樂連接的橋樑, 唱出一個充滿好奇心, 勇氣與希望的地方. Noa, Israeli Born, NY raised singer/songwriter of Yemenite origins, is an internationally renowned artist, who has performed on the world’s most prestigious stages, including numerous performances in the Vatican for three Popes, the White House, Carnegie Hall, Lincoln Center, and the most important theaters of Europe. She has been produced and endorsed by Pat Metheny and Quincy Jones and shared the stage with Stevie Wonder, Sting, Andrea Bocelli and many others. She is Commander of the order of Merit of the Italian Republic, Good Will Ambassador to the UN, Global Leader of Tomorrow and has received endless awards for her artistry and commitment to peace between Israelis and Palestinians. 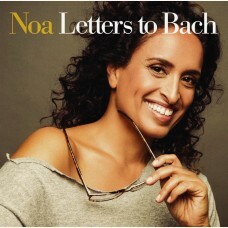 Noa’s new musical project is entitled “Letters to Bach,” executively produced by Quincy Jones. 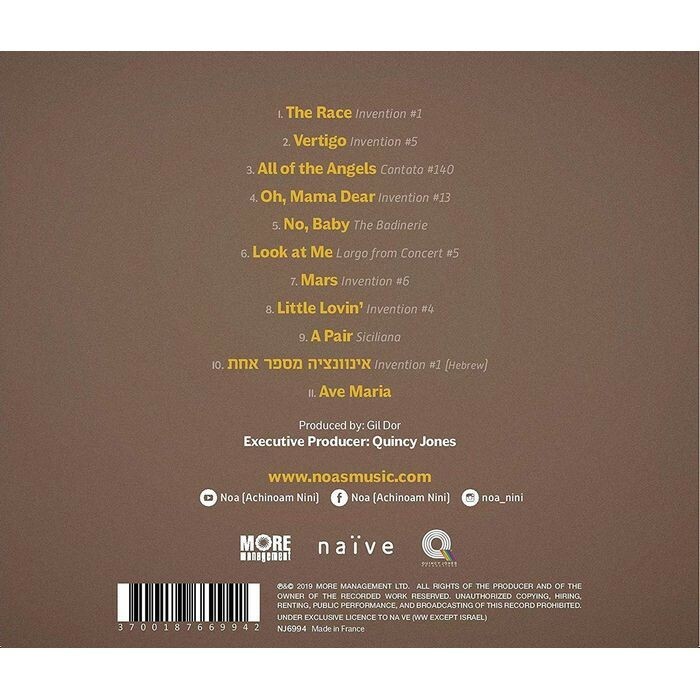 It is comprised of 12 pieces of instrumental music written by Johann Sebastian Bach for which Noa has written English and Hebrew lyrics, inspired by subjects as diverse as technology and religion, global warming and feminism, euthanasia, the Palestinian-Israeli conflict, and relationships in the age of social media. The arrangements for guitar were done by Noa’s long-standing musical collaborator Gil Dor, guitarist, composer, arranger and educator. The duo’s performances are surprising and brilliant, with Noa’s voice both soaring majestically and skipping playfully between the notes, intertwining perfectly with Gil’s guitar, illuminating Bach’s brilliant polyphony. In this project, Noa and Gil strive to break the binding walls of language, religion, genre, generation, and stigma to build a bridge of musical excellence, respect and joy, a place of curiosity, courage and hope… all under the auspices of the great super-connector, Johann Sebastian Bach.